This was my first experience of going to Museum Advocacy Day. I was so excited to go as I had been looking forward to it for some time and was finally able to go. I arrived early so I could help the Utah Museums Association (UMA) Board set up for this wonderful event. Once setting up was done, and the rest of my group arrived, we were swept to orientation. Talking about the blue and green sheets and what we were supposed to do with them. I was excited the whole day, not just because I was there in a beautiful building, but because I was there to represent the Museum of the San Rafael and Pioneer Museum to our State Senator and Representatives and thank them for their support. After orientation, we headed off to the Senate. Talma Peacock, Dawnette Tuttle, and Kristi Maxwell (Board Members of the Museum of the San Rafael) and I talked about seeing our Senator, David Hinkins, who is a local of Emery County. Senator Hinkins stood outside the Senate door. Greeting us with hugs, he was smiling from ear to ear. “It is good to see friends from home.” He said then asked us if we would like to see where he sat. Senator Hinkins took us on the Senate floor before the meeting started. I felt like we got a little bit of a VIP Tour. He then told us he would come down and see our booth later, and we exited heading up to the gallery to be introduced to the Senate as part of the Utah museum community. After observing the Senate, we then rushed over to observe the House. Once we finished in the House we had the privilege of sitting at our booth. 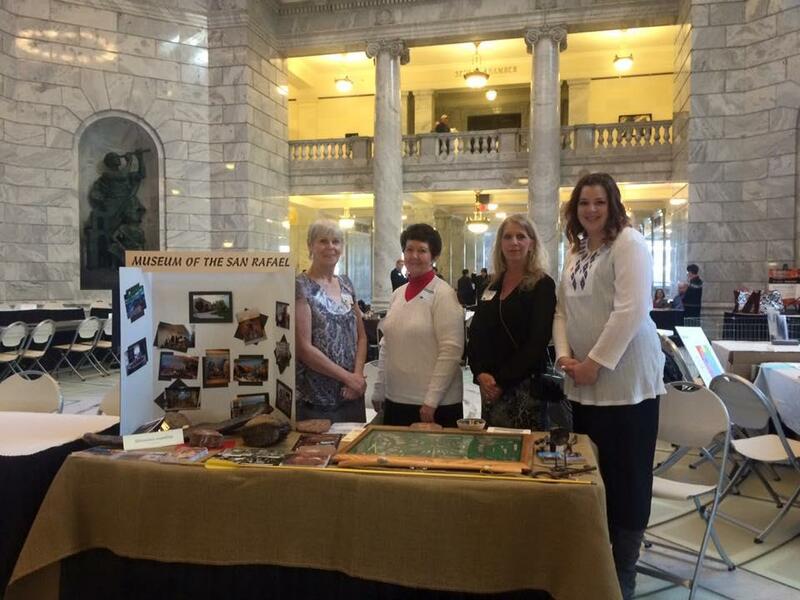 It was great to have the opportunity to tell people about our area and our museum the whole day, often talking to people who had never heard of Emery County, or our museum. Toward the end of the day we had a highway patrolman come to our table and ask questions. We had a key gun artifact at the table. I was able to tell him about key guns and what they were used for. This fascinated him, he wanted to get a picture of it, as well as take a brochure about our museum. He said he wanted to bring his family down to see our museum. After he left, another highway patrolman came to the table telling us the last guy told him that he needed to come and ask about an artifact we had. Smiling at him, I told him about the key gun. Another pleased visitor, he also walked away with information about our museum. Just as I was about to sit down another highway patrolman came to our table and said, “I’ll bet you can’t guess what I want to know about.” This made me and my crew laugh. I told the story to the last highway patrolman, asking them if they would pass the word along to the others to bring their families to our museum. This day was wonderful! I asked the ladies who were able to go with me from our board, and they said their favorite part was being there and mingling with other museum professionals, as well as meeting others and promoting our museum. Maegan Wilberg is the Director of the Museum of the San Rafael and Pioneer Museum in Castle Dale, Utah.